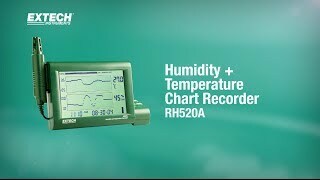 The Extech RH520A Humidity and Temperature Chart Recorder is suitable for applications where you need to monitor and record laboratory or clean room temperature and humidity history, keep track of process conditions and create warnings when conditions are outside of required limits. This system configures easily to your needs, mounting to a desk or wall, allowing for viewing of temperature and humidity trends with a date and time stamp. The Extech RH520A Humidity and Temperature Chart Recorder comes standard with a 110V power supply. Or upgrade to the 220V or 240V model. The Extech RH520A Humidity and Temperature Chart Recorder is available with standard factory calibration or with NIST Calibration Certification (adds 5 days to product lead time). NIST certification offers a traceable certificate that satisfies ISO & other regulatory requirements for product accuracy traceability to nationally recognized reference standards.